The Best Small Group Leader Ever called his group members friends. But perhaps that word meant more to him and them than it usually means to you and me. “Greater love has no one than this,” Jesus said, “that he lay down his life for his friends” (John 15:13). Real friendship is sacrificial. A healthy group is a group of real friends. A healthy leader considers the members of the group as friends, not as students, participants, or “those people who come to our house every week.” As the leader, you invest into the friendships first, especially with the Core Team. Joe and I have been in small group with Gary Wood for about five years now. I wasn’t sure about a “bible study,” but this group is so much more. Our group is small, but the friendships we have formed are everlasting. Our small group, with Gary as our leader, not only studies the Bible, but we hold each other up; we encourage each other in good and bad times; we have moments where we laugh and sometimes cry; we love each other, no matter what; and we know in our hearts that Jesus Christ is always with us. Gary keeps us focused, and he is one of the best friends Joe and I could ever have! Wouldn’t you want someone in your group to say the same about you? How else is friendship a vital part of leadership? 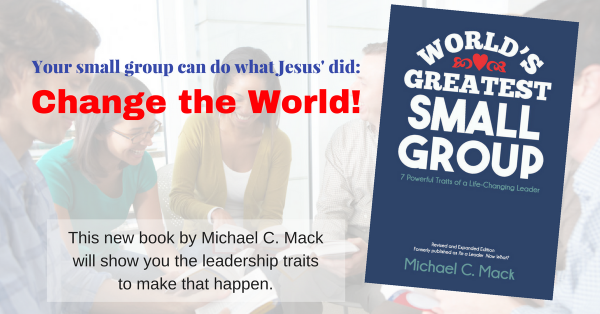 This post is excerpted from Chapter 2 of my book, Small Group Vital Signs, from TOUCH Publications. Next article 5 Minute Daily Devotions for Leaders … C’mon Man!